Luc Descheemaeker (aka O-Sekoer) of Belgium was awarded a special prize ("honorable mention") at the infamous Holocaust cartoon contest organised by the Iranians. He also received $ 1,000 cash prize. Luc Descheemaeker teaches art and "culture" at the Sint-Jozefsinstituut at Torhout, a catholic school in Flanders. Regards, a Belgian Jewish magazine, (July 2016 issue) contacted the school and was told that they were immensely proud ("très fière") that one of their teachers had been awarded the prize. The matter seems to have rested there. 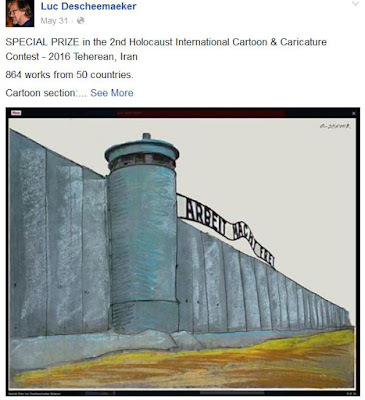 On 18 December, Luc Descheemaeker proudly posted on his blog his award-winning Iran Holocaust-mocking cartoon "embellished" with a drawing by British street artist Banksy, titled Report Descheemaeker vs BANKSY in Tehran (see Resistart too). Whereas Banksy is an original artist, Luc Descheemaeker's work is unimaginative and dull resorting to the recycling of conventional images. It is extremely doubtful that Banksy and any serious artist would stoop so low as to take part in a Holocaust-mocking contest considering the theme and the number of Holocaust deniers and Jew haters that took part. At the award ceremony in Teheran, which he did not attend but was in contact by videolink, he boasted to have accepted an invitation for a "personal exhibition in Teheran in 2017". 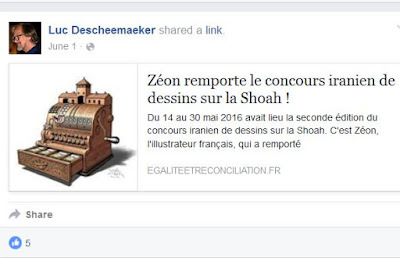 Descheemaeker is much appreciated by his Catholic school, the media (Nieuwsblad reported that he had won a prize in Iran, but not a word about the content) and the local authorities at Turhout. 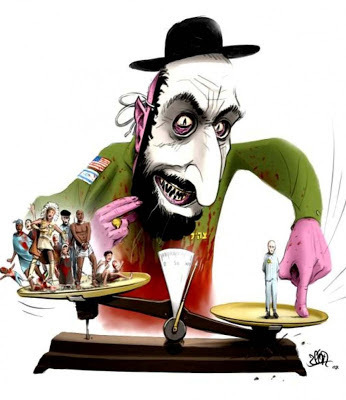 Except for two Belgian Jewish magazines, the fact that he participated in an antisemitic contest doesn't seem to bother many people in Belgium. 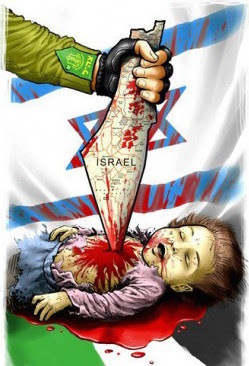 The carton below is by Zéon, known for his antisemitism, and won the first prize. It was lifted from Alain Soral's blog Egalité et Réconciliation an posted by Descheemaeker - which goes to show something about his tastes and leanings. Alain Soral is a friend of Dieudonné who hates Jews and gays. UK: Labour Party finds itself innocent!